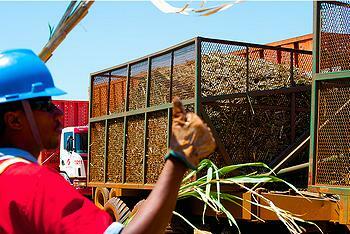 SAO PAULO, Brazil, June 7, 2001 (ENS) – Brazil’s state-run bank announced increased investment for sugar cane ethanol production Monday at the Ethanol Summit, organized by the Brazilian Sugarcane Industry Association, UNICA. The Brazilian Development Bank, BNDES, pledged 30 billion to 35 billion reais (US$19 billion to $22 billion) to finance development in the sugar cane sector through 2014. Brazil is in a privileged position in the world as a large biofuel producer, particularly sugarcane ethanol, but current industrial technology is reaching its limit, said BNDES in a statement. The latest challenge is related to mastering technologies to produce second-generation ethanol from biomass. The biennial Ethanol Summit, launched in 2007, this year adopted the theme Solutions for a Low-Carbon Economy. It has attracted a record number of delegates; more than 2,000 business executives, experts, investors, NGO representatives and government officials are in attendance at Sao Paulo’s Grand Hyatt Hotel, organizers said. “We will further broaden the debate, bringing to the table a growing variety of cane by-products that contribute directly to the reduction of greenhouse gas emissions, making sugarcane and ethanol increasingly important tools in the pursuit of the so-called low-carbon economy, said UNICA President Marcos Jank. “Brazil has taken a leading role in global alternative energy discussions. UNICA has been working to create awareness and disseminate information on renewable energies,” said Jank. Brazil started using sugarcane ethanol as a fuel for motor vehicles 40 years ago, and Energy Minister Edison Lobao told conference participants the Government of President Dilma Rousseff intends to promote expansion of ethanol as a fuel to help the country keep its renewable energy matrix in the coming decades. At the conference, ethanol producers welcomed the promise of investment. Although prices for the biofuel are high and it powers an increasing number of cars on Brazilian roads, the country’s sugarcane industry has lacked sufficient financing to support the growth required to meet the demand. UNICA represents the top producers of sugar and ethanol in the country’s South-Central region, especially in the state of Sao Paulo, which accounts for about 60 percent of the country’s sugarcane harvest and of total ethanol production. The popularity of sugarcane ethanol in Brazil soared in 2003 with the introduction of flex fuel vehicles that run either on pure ethanol or on petrol, which in Brazil is mixed 20 to 25 percent with ethanol. More than 90 percent of new cars sold today in Brazil are flex fuel, and these vehicles now make up about half of the country’s light vehicle fleet. 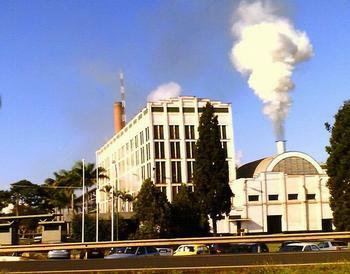 Environmental officials estimate the use of sugar cane ethanol in Brazil has reduced the country’s greenhouse gas emissions by some 600 million metric tons of carbon dioxide since 1975. In 2010, Brazil produced an estimated 620 million metric tonnes of sugar cane, which yielded 37.8 million tonnes of sugar and 27.4 billion liters of ethanol, making it the world’s second-largest ethanol producer, behind the United States. Upcoming global events in Brazil like the World Cup of soccer in 2014 and the Olympic Games in 2016 respectively, will draw the world’s attention to solutions that utilize renewable energies. 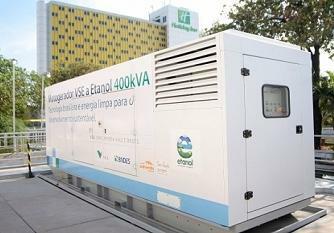 Brazil intends to showcase ethanol-powered generators James Pessoa, CEO of Vale Solucoes em Energia, told Ethanol Summit participants on Monday. Vale is working on new technologies such as the gasification of sugarcane biomass, which is being developed in a partnership with the Institute for Technological Research.